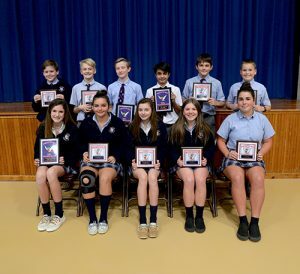 Worcester Preparatory School recently presented middle school basketball sports awards at a ceremony. The seventh grade girls honorees were Ansley Gardner, MVP; Esi Mehilli, Coaches Award; and Mary Kate Barnhart, Most Improved Player. The eighth grade leaders were Linley Hill, MVP; Zoe Brafman, Coaches Award; and Thalia Vasilikos, Most Improved Player. The seventh grade boys trophy winners were Sam Menendez, MVP; Dylan McGovern. Coaches Award; and Hunter Simons, Most Improved Player. The eighth grade boys winners were Griffin Jones, MVP; Harrison Humes, Coaches Award; and Timmy Hebert, Most Improved Player. Pictured, seated from left, are Gardner, Mehilli, Barnhart, Brafman and Vasilikos; and standing, Hebert, Humes, Jones, Menendez, McGovern and Simons.